Chicago police have identified a robbery pattern in which victims have been forced to withdraw money from Wrigleyville ATMs by men who displayed or implied that they had a firearm. In the Racine incident, both offenders are described as black men between 20 and 30 years of age. One of them was about 5'10" tall, 145 pounds, with short hair. He wore a black beanie had with a red stripe. Both men fled in a black car. 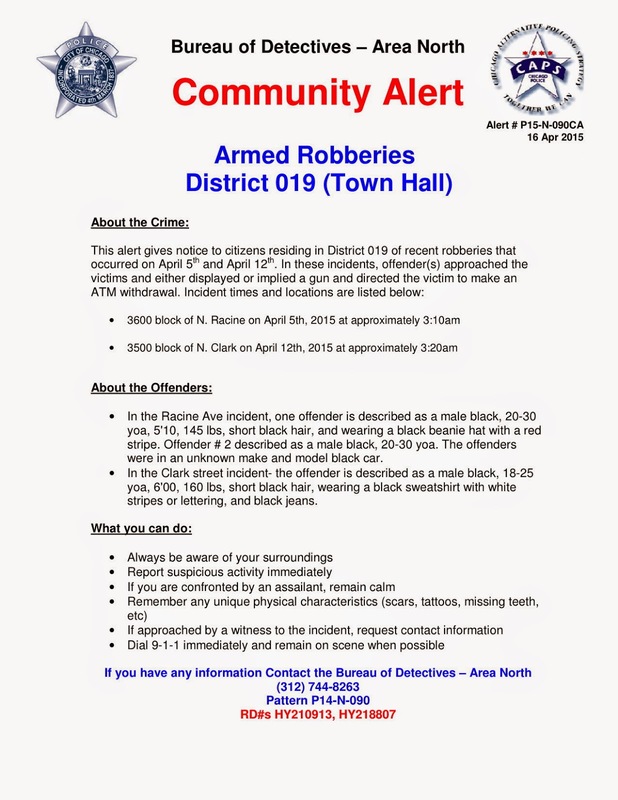 The gunman on Clark Street is described as a black man between 18 and 25 years of age, 6' tall, 160 pounds, short air, wearing a black sweatshirt with white stripes or lettering, and black jeans. If you have information about these incidents, Area North Detectives would love to hear from you at 312.744.8263. Refer to pattern P14-N-090.